We offer Martial Arts instruction based on Traditional Aikijujutsu, Aikido, Okinawan Karate, and Weapons with emphasis on everyday Self-Defense. The teachings are based in the tenets of traditional martial arts systems and addressed for self defense in today's society. Utilizing the time honored techniques we provide self defense instruction for men, women and children in a cooperative learning environment. Honor, Loyalty, Rectitude, Benevolence, Veracity, Respect, Courage! Self-Defense for Men, Women and Children. was honored to be accepted as a student in this school. to acquire them as a student. than 200 participants in the seminar. The first time I stepped into a dojo was September 1984. 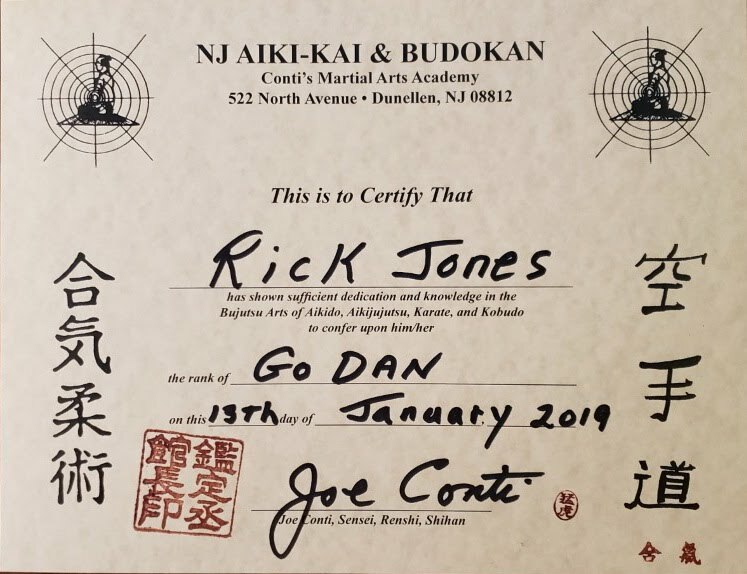 I can say without exaggeration, with the many practitioners I have met, studied with, and under within that time, I was able to conclude the following: Jones Sensei is physically the most superior martial artist I have ever met, let alone seen. I have been fortunate enough to see him execute several techniques, which unless you witnessed for yourself, you would not believe the speed, accuracy, and effect was possible. I also have been fortunate enough to be on the receiving end several times. Because of this, I believe I have benefited greatly with my own knowledge. Nami No Michi Kyokai translates to "The Way of the Wave Association". This association will be for those that choose to follow the way of the true martial artist and study all of the arts available at the Budokan. As the waves of the ocean are endless and continually shaping the form of the coast with each crash, so shall you change and grow in your study at the Budokan. Once water stops flowing and becomes stagnant, it can lose its clarity. A trickle of water over time can carve its way through rock and earth by its tenacity and continuing movement, while a tsunami can be catastrophic in one crash. The shape and forming of a cresting wave, share a very core value with many techniques and concepts. are those established after the Meiji Restoration (1869). Koryu and Gendai are interconnected and contain Do (way or path) and Jutsu (technique) aspects, share blood lines, but may no longer have direct political ties to those original arts. Our lineage can be traced to the founding fathers of Daito Ryu, Aikido, Shorin Ryu and Isshinryu. The oral and physical teachings have been passed down from generation to generation with care not to lose the original essence of the martial ways of those that have gone before.